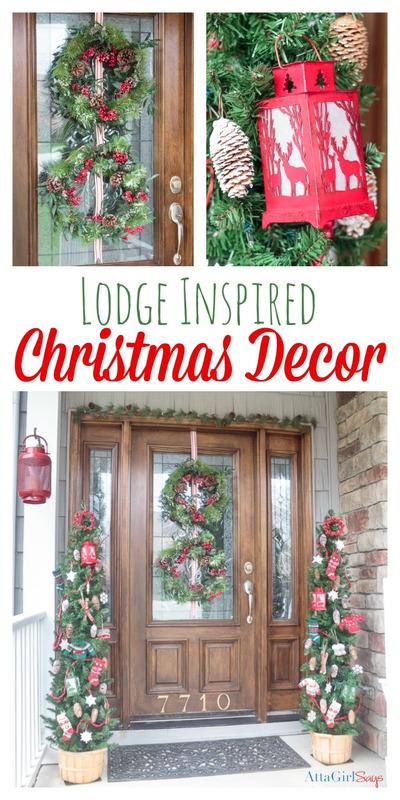 Are you looking for ideas to dress up your front door for Christmas? 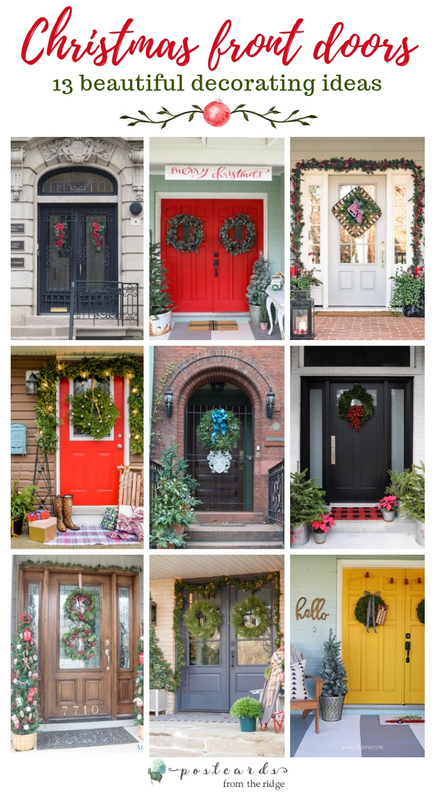 I always love seeing beautiful front doors and have rounded up some beautiful ones that are dressed up for the holidays. The top image with the black door and the one below were taken during a visit to Washington, DC last December. There were so many pretty doors and entrances. The whole area looked so festive. The swags on the black iron doors had some pretty red poinsettias. 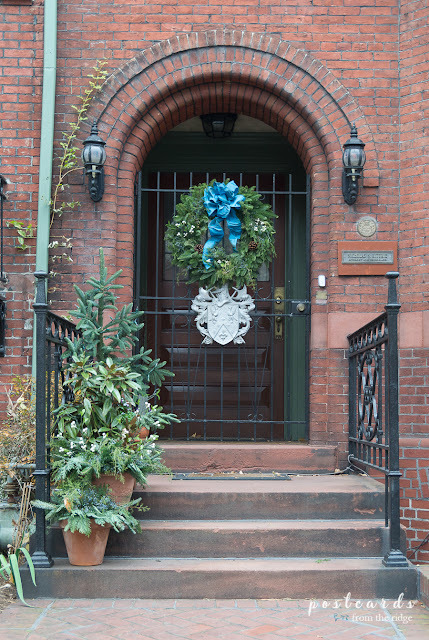 And the blue ribbon on the brick arch entry wreath really popped against the green wreath and terra cotta color brick. So inspiring. 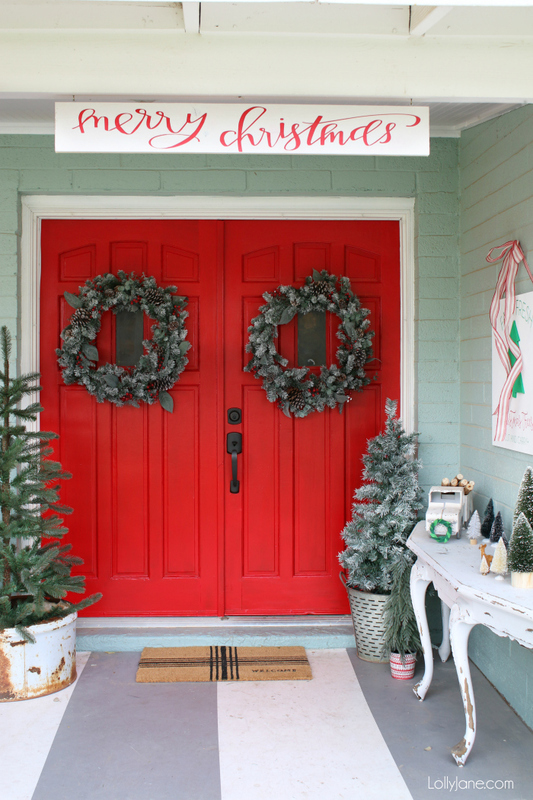 How festive are these red front doors from lolly jane? 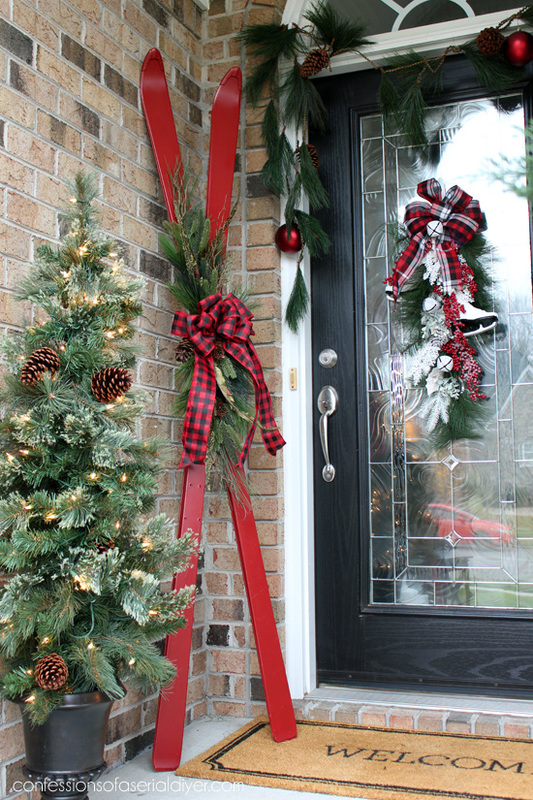 That red really pops against the green brick color and looks great with the big Christmas wreaths. 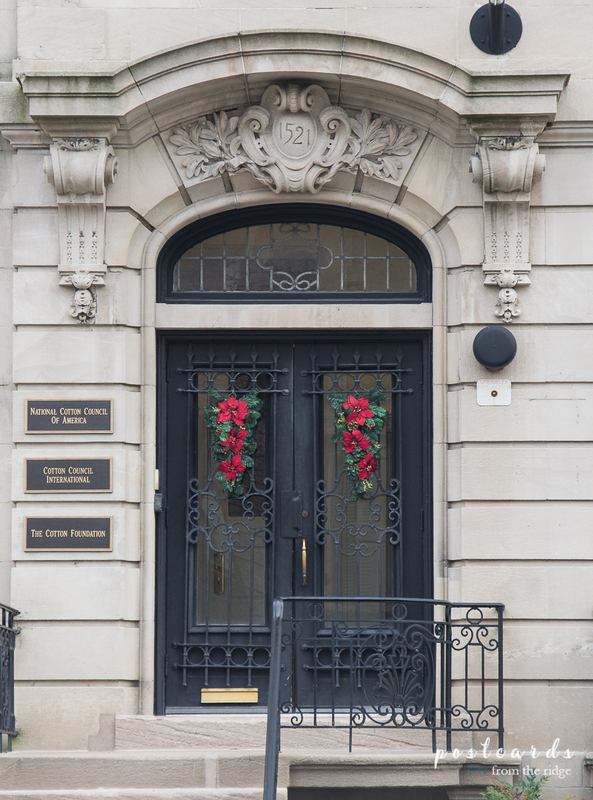 The same doors were previously painted a bold yellow and dressed up with boxwood wreaths. Don't you love the little sled? 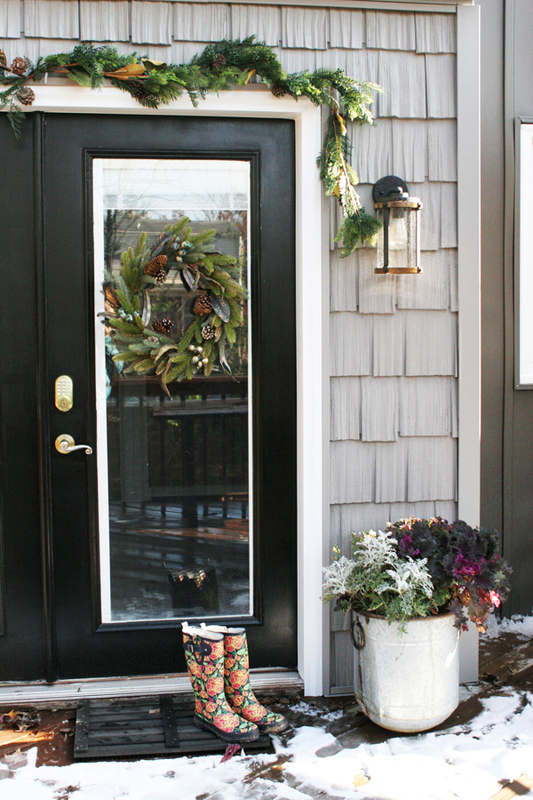 Colorful Christmas decorations look so pretty against this black door belonging to pink peppermint design. Ariel at pmq for two has added a lush garland and wreath to her pretty red door. The lights and ornaments give it a touch of glam. And her decor is so pretty. Christy at Confessions of a Serial DIY-er added a wintry look with these pretty skis. She shares the project over on her blog HERE. Isn't this porch cozy and welcoming? Suzy at Worthing Court really knows how to make things look festive. 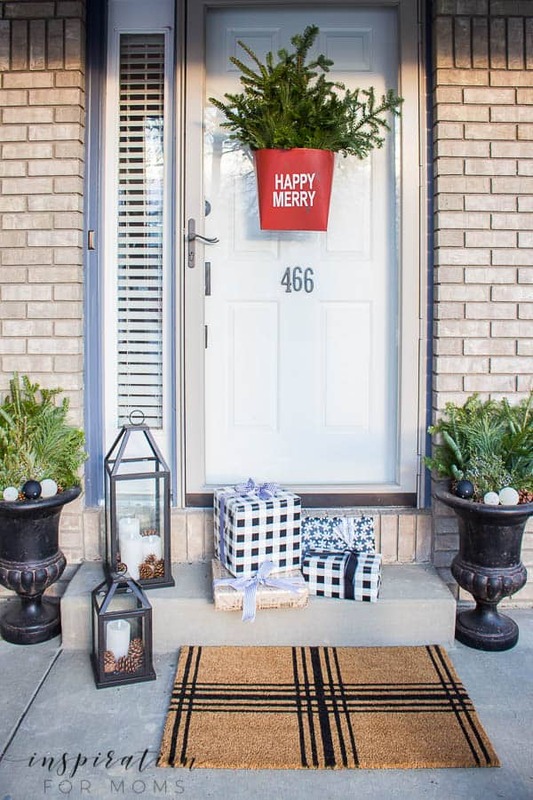 That front door wreath on the tobacco basket is so charming. Ashley at Bigger Than the Three of Us has a subtle natural look on her doors. I bet that lighted garland looks so pretty at night. 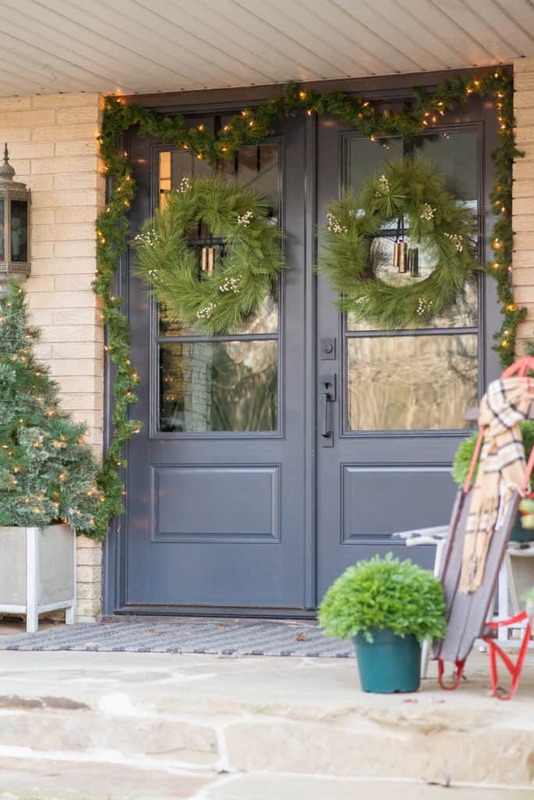 A fresh garland, wreath, and winter plants give this porch at Craftivity Designs a pretty rustic look. And the snow made a special appearance for her photo! The garland with those giant pine cones and dried flowers are is pretty. 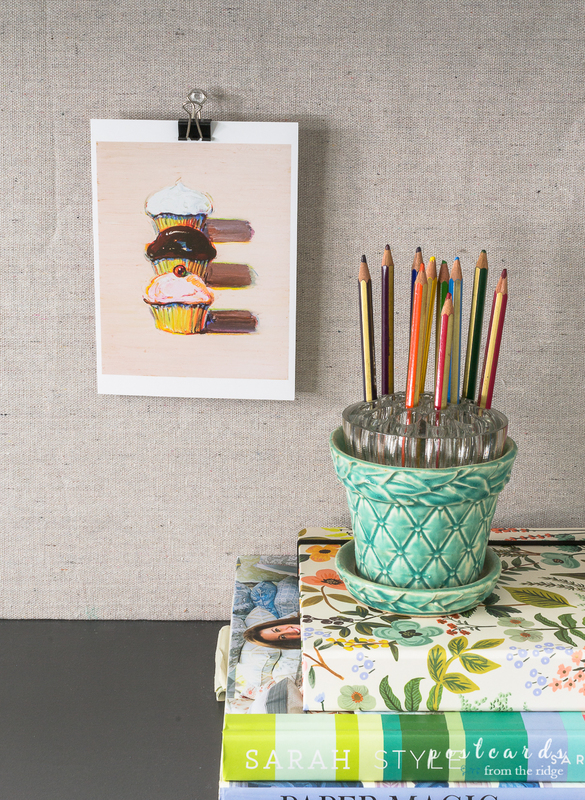 Marianne at Song Bird shares her tutorial for making one HERE. also added some branches to her planters and pine cones to some candles for a timeless holiday look. 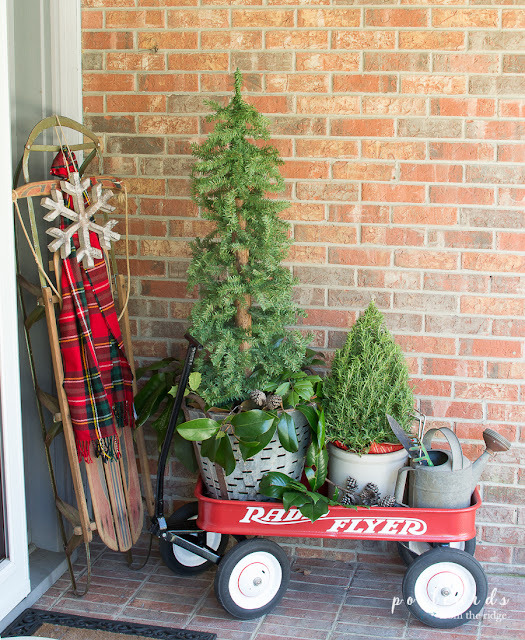 Amy at atta girl says really does Christmas porches right. Aren't the decorated trees fun? 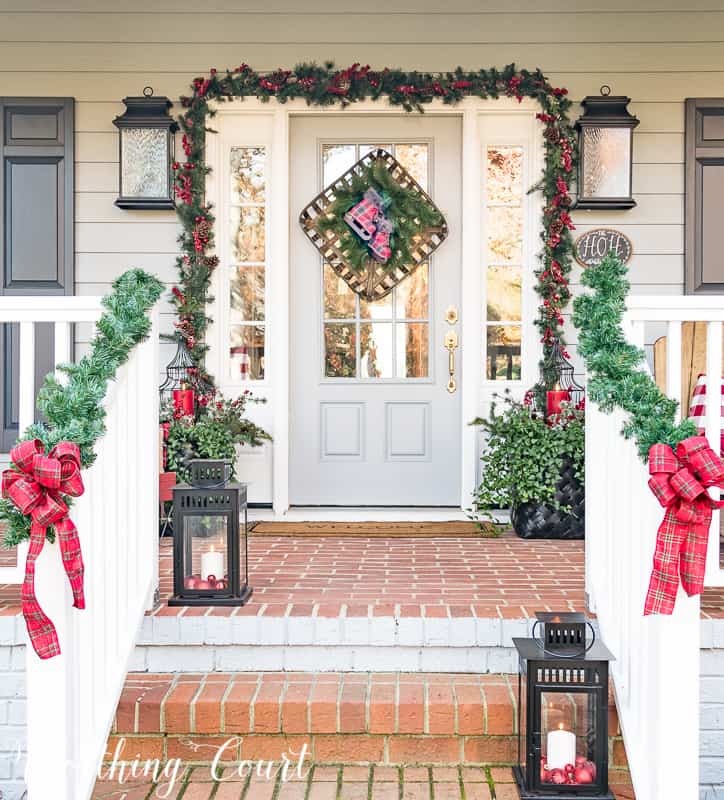 And I love the stacked wreaths on her pretty front door. 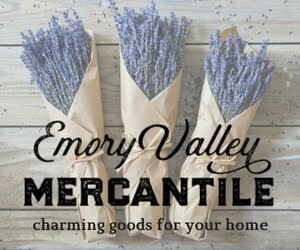 Here's a peek at our porch decor for this year. I'll be sharing all of it in a few days so be sure to watch your inbox for the details. 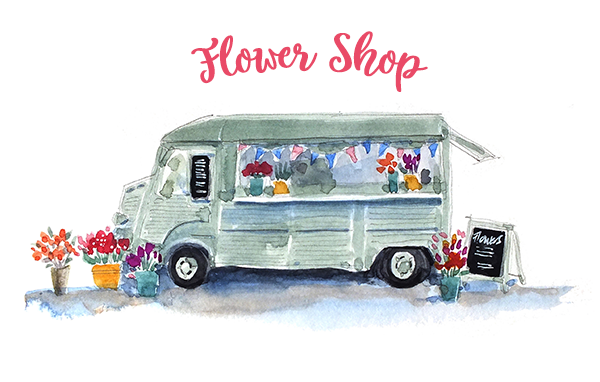 Sign up below if you're not already receiving my newsletter and you'll never miss a post. I hope you've gotten some good ideas for decorating your front door for Christmas. Let me know in the comment section which ones are your favorites. 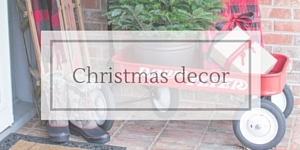 Need more Christmas decorating ideas? 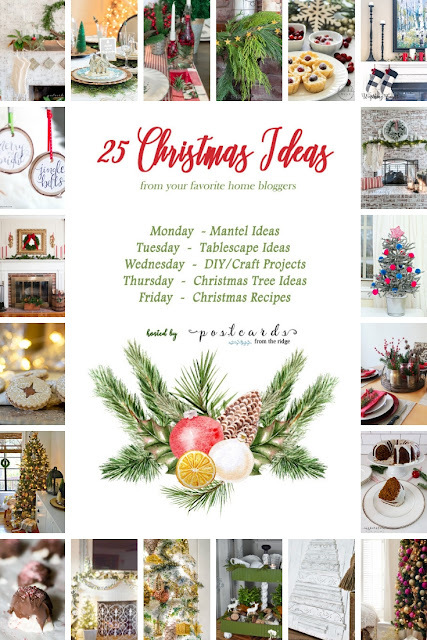 Visit the Christmas Ideas Tour and see favorite ideas from 25 home bloggers. Go HERE to see the tour. 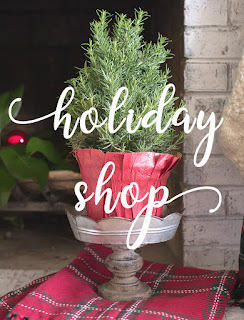 For all of my past Christmas decorating ideas dating back to 2011, go HERE. 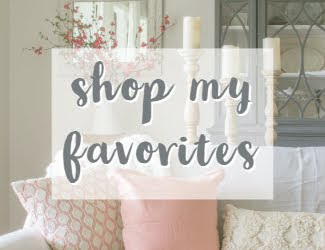 And for over 100 of my favorite Christmas decor items, visit my holiday shop HERE. 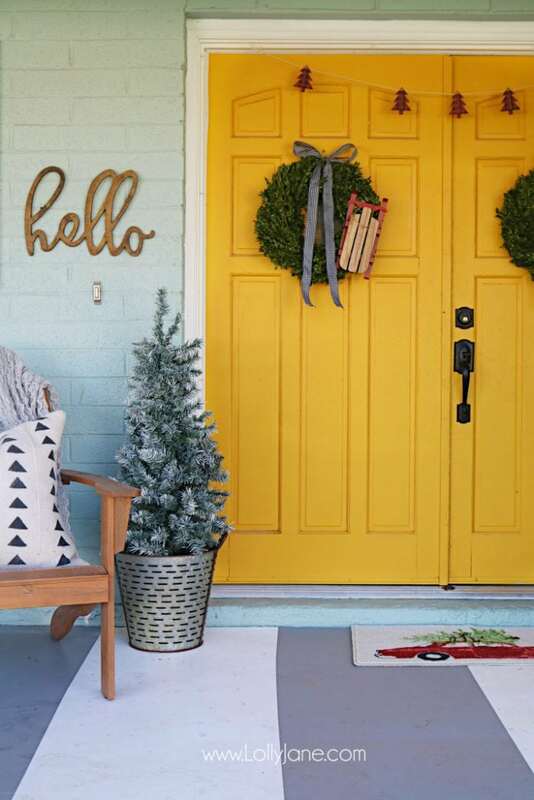 Does your front door need a fresh coat of paint? 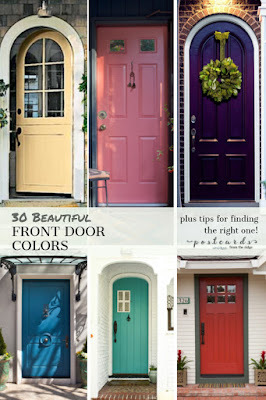 30 great front door colors plus helpful tips for finding the right one can be found HERE. These are all so beautiful, but i really do need to paint mine, so i try not to go out the front,lol! Thanks!